More proof? The fledgling Miami New Drama will present the venerable Thornton Wilder’s Our Town in October about life in small town New Hampshire around the turn of the century – except the families will speak English, Spanish and/or Creole. Actors’ Playhouse will open its season with a revival of Evita – presented in English the first four weeks and Spanish in the following three weeks. And if you erroneously expect only comfort food from the Maltz Jupiter Theatre, one offering is the scalding social commentary reboot of An Inspector Calls. They are all part of a 2017-2018 season embodying the region’s evolution. The emphasis on new work will continue to increase, small companies will keep pushing the boundaries of audience expectations and most conservative companies will nudge at their audiences’ comfort zones. Just the scope is overwhelming: The region from Vero Beach to Key West hosts well over 100 companies. It encompasses professional troupes with seven-digit budgets, community theaters that date back more than six decades and children’s theaters undertaking decidedly mature fare, daring collegiate offerings and surprisingly effective high school productions. To keep track, our calendar at Florida Theater On Stage (click here) lists every theater-related production in the coming 18 months that companies have announced. In our drive to be complete, accurate and up-to-date, we will update changes in dates, titles and extensions when we are notified. Some companies are still solidifying titles and dates at press time, but they will added as they become available. It’s impossible to spotlight even a tenth of what’s available, but here’s a subjective review of some of the most intriguing prospects. That Broadway Across America show opening at the Arsht Center in Miami Oct. 5 was a surprisingly conventional musical in every aspect, but the nuclear energy, cultural pride, considerable polish and boundless joy that poured over the footlights in New York was irresistibly enthralling. Miami native Ana Villafane who gave a phenomenal performance as Gloria will not be touring, but New York ensemble member Christie Prades has the show’s full confidence. 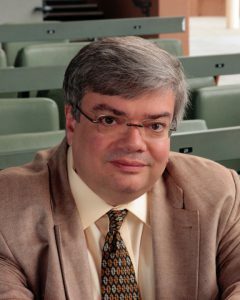 Veteran local musical director Manny Schvartzman, who aided the original production, will be the tour’s associate music director. While publicity has implied that the Arsht’s 10-day-run is the start of the tour, it actually opens in that center of Latin culture Buffalo, New York, on September 22. To read our review of the Broadway production, click here. 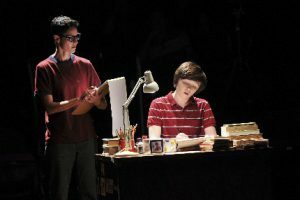 Producers never brought the national tour of the acclaimed musical Fun Home to South Florida, just as they passed over the region for the tour of Next To Normal. Fortunately, local companies knew their audiences better; Subsequently, Next To Normal had three successful local productions. Sure enough, Zoetic Stage will stage the Tony-winning Best Musical Fun Home at the Arsht in April. The moving show is based on Alison Bechdel’s autobiographical graphic novel about growing up with a closeted father and her discovery of her sexuality. It features an insightful book by Lisa Kron and a brilliant score by Jeanine Tesori. To read our review of the Broadway production, click here. Palm Beach Dramaworks forged its reputation with solid productions of existing thought-provoking and classic titles from Albee to O’Neill. But it has been developing new works in its Dramaworkshop program for three years and this season is offering two world premieres in its usual five-play menu. First up in December is Billy and Me, by Wall Street Journal critic Terry Teachout (who wrote last season’s Satchmo At the Waldorf). It’s a two-hander focused on playwrights Tennessee Williams and William Inge. The idea was conceived by Producing Artistic Director William Hayes while he was directing Inge’s play Picnic in 2015, especially how one career was on the rise as the other was on the decline. Actors Nicholas Richberg and Tom Wahl have been working with Hayes and Teachout all year as the script has developed. Then in March, Dramaworks will produce the first full production of Edgar & Emily, a comic fantasia in which emerging poet Emily Dickinson is unexpectedly visited by a desperate Edgar Allen Poe. GableStage stays true to form with challenging plays fresh off New York stages, notably this October with Stephen Karam’s Tony-winner The Humans, which dissects modern life through a holiday party drawing together a disparate family. To read our review of the New York production, click here. Also on tap on April is Gloria, by Pulitzer finalist Branden Jacobs-Jenkins, considered one of the most intellectually-challenging playwrights examining race. And for less weighty evenings, there will be Becoming Dr. Ruth by Mark St. Germain (Freud’s Last Session) which was presented at the Parker Playhouse a few years ago. City Theatre seems active almost year-round now. Known for mounting short plays, City Theatre is offering in September its first full-length play in quite a while. It will present Building The Wall by Robert Schenkkan who won the Pulitzer for The Kentucky Cycle and more recently won praise for All The Way about LBJ. The production is part of the Rolling World Premiere program from the National New Play Network in which a play gets multiple premieres so the author can develop the script from production to production. In this case, the script has already been published and is being produced around the country. Set in a prison in the near future of the Trump administration, a historian (Karen Stephens) interrogates a man who ran an American internment camp (Gregg Weiner). Slow Burn Theatre in Fort Lauderdale isn’t doing a world premiere but it’s once again taking chances with material — Disney’s Tarzan in October requiring considerable “flying” by actors, Jason Robert Brown’s gorgeous musical version of The Bridges of Madison County that did not fare well in New York, Rock of Ages during the summer, and the beloved but technically ambitious The Secret Garden. Once again it will perform smaller shows Peter and the Starcatcher and the satirical Disaster! in the Broward Center’s Abdo New River Room as well as the Aventura Arts & Cultural Center and the Old School Square in Delray Beach – making it the only company performing in all three counties. The Maltz Jupiter Theatre is famous for productions of well-known popular titles pointedly given a fresh presentation. Sure enough, this year offers South Pacific, Newsies and Hairspray, but also the socially conscious comedy Born Yesterday on October and, in its annual take-a-chance slot in February, An Inspector Calls – a hoary 1945 British drawing room play transformed by a 1992 revival into a scorching commentary on the caste system and social responsibility. Actors’ Playhouse, which took a huge chance last season by running Million Dollar Quartet for 11 weeks, is doubling down on its bet by bringing the barnburner back for another long run in the late spring. To read our review, click here. But Actors is starting the season off with a revival of its own production of Evita in English and later in Spanish. Also echoing earlier Playhouse successes are Noises Off and The Big Bang, plus an original run at the romantic Irish musical Once. Equally alluring are titles from the three major national tours seasons – not counting companies whose shows appear for a couple of days at smaller venues. 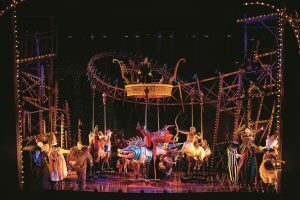 Just a sampling: At the Broward Center, Love Never Dies, Andrew Lloyd Webber’s sequel to his Phantom of the Opera; the dark farce A Gentleman’s Guide To Love and Murder, School of Rock and the tender Waitress. The Arsht will have Finding Neverland and The Book of Mormon. The Kravis brings in the most meta-musical comedy ever to feature Shakespeare, Something Rotten. Both the Kravis and the Arsht will bow The Bodyguard, a stage musical version of the 1992 Whitney Houston film that notably has yet to play in New York but which received a wide range of reviews in London. The proudly mainstream Wick Theatre zeroes in on the musicals that Marilynn Wick believes her audience craves. This season includes the affectionate spoof The Drowsy Chaperone, She Loves Me, Singin’ in the Rain, Jerry’s Girls as in Jerry Herman, and a rarely-performed show with one of the most beautiful scores in musical theater, Brigadoon in March. It’s also hosting New Year’s Eve and Day with Hal Linden (a former Broadway star himself) and a fictional Evening with Edith Head, the legendary film costume designer, in conjunction with its new exhibit in its adjacent Costume Museum. Thinking Cap Theatre in Fort Lauderdale has a season that follows the calendar year. Already slated for later this year are such works as Straight White Men by up and coming playwright Young Jean Lee plus the rock-infused Lizzie The Musical, as in Lizzie Borden. Theatre Lab based at FAU in Boca Raton has another season of new works, but also is instituting a season of play readings and master classes. The kick off with feature Pulitzer-winning Miami playwright Nilo Cruz with the reading of three Cruz scripts and master class from Oct. 6-8. Even the region’s community theaters have intriguing seasons. Pembroke Pines Theatre of the Performing Arts is delivering the crowd-pleasing How To Succeed In Business Without Really Trying, but also the intense play Judgment At Nuremberg. The 65-year-old Lake Worth Playhouse is offering Oliver! but also Lerner & Loewe’s rarely-seen Paint Your Wagon. And the 71-year-old Delray Beach Playhouse, which contrary to legend did not entertain Ponce de Leon, is doing both Annie Get Your Gun and Who’s Afraid of Virginia Woolf. You’d think that Chess and Ragtime would be titles for big-budget Equity houses, but both will be mounted by Florida Children’s Theatre (formerly Fort Lauderdale Children’s Theatre); and Area Stage Company’s conservatory in Miami will do Winnie the Pooh, Cinderella – and Carrie. As usual, the list of theater companies and venues ebbs and flows with each season, but observers are encouraged that young troupes often called scrappy and fledgling (terms that some see as condescending) are putting down roots. —The new management at Arts Garage in Delray Beach is trying to decide how to proceed after deciding that the last series was logistically impossible to support fiscally. But the former head of that program Keith Garsson has revived his dormant Primal Forces company, which produced several impressive low-budget intimate dramas a few seasons ago such as Sunset Baby. In the coming year, it plans to work out of the tiny Andrews Living Arts venue in downtown Fort Lauderdale. It opens October 13 with The Good Girl, a dystopian vision by Emilie Collyer about the owner of a brothel populated by robots. —New City Players, now three seasons old, just completed a three-play season at The Vanguard Sanctuary for the Arts in Fort Lauderdale and is currently solidifying its next season. —MNM Productions, based at the Kravis Center’s Rinker Playhouse, also just finished its second season of large-cast musicals such as Hair and Spamalot that have engendered rousing audience reaction. It, too, is nailing down its season. to Tracy Letts’ Superior Donuts to Michael McKeever’s Clark Gable Slept Here. J’s Cultural Arts Theatre – a venerable community theater at the Michael-Ann Russell Jewish Community Center/Sanford L. Ziff Campus in North Miami Beach – bowed this year as professional company with Ben Andron’s Broken Snow starring Avi Hoffman. It plans to continue this season (possibly in a new building on campus) with Joseph and the Amazing Technicolor Dreamcoat, Last Night Of Ballyhoo and Kindertransport, a play about the legacy of children who escaped the Holocaust. Some companies are in new digs. Outré Theatre Company, which seems to have had a new venue each year, has settled in its sixth season at the spanking new Pompano Beach Cultural Center where it plans to deliver Green Day’s American Idiot in November, an all-female version of Quentin Tarantino’s film now retitled Reservoir Dolls, and Hedwig and the Angry Inch. After moving from venue to venue to venue, M Ensemble, the state’s oldest African-American theater continuously in operation, finally is firmly entrenched in the gorgeous new county-owned Sandrell Rivers Theater at the Audrey M. Edmonson Transit Village in Miami. Announcements about their new season are still to come. Local audiences have proven their receptivity to new works, leading to an ever-increasing proliferation of world premieres, southeast U.S. premieres and still-in-production events. It’s difficult to find companies that aren’t at least hosting staged readings. The cornucopia of new works includes Christopher Demos-Brown’s Wrongful Deaths and Other Circus Acts at Zoetic Stage, Andrew Bergh’s The Radicalization of Rolfe (as in the “Sixteen Going On Seventeen” Rolfe) at Island City Stage, Peter Sagal’s Most Wanted at Theatre Lab in Boca Raton (plus state premieres for works by Lauren Gunderson and Deborah Zoe Laufer), and Mad Cat Theatre’s Jessica Farr unveiling Wake Of The Flood. Several presenting houses are also offering a wide array of Broadway-related revues and concerts with Broadway stars “at liberty” such as Audra McDonald at the Kravis in March, and arguably the most high profile event, Chita Rivera and Tommy Tune at the Parker Playhouse on January 19. Tune will appear solo at the Maltz Jupiter Theatre in November. The Crest Theatre in Delray Beach has Andrea McArdle and Donna McKechnie together in February, plus In The Heights’ Mandy Gonzales, An American In Paris’ Max Von Essen (also in Aventura, and Santino Fontana of Cinderella at the same venue). But there are many more across the region. Like several venues, Delray Beach Playhouse will host lesser-known names in different shows spotlighting music associated with Bob Fosse, Kander & Ebb, Stephen Schwartz and Angela Lansbury. For slightly higher brows, Florida Grand Opera is returning with Donizetti’s Lucia di Lammermoor, Strauss’ Salome and Gluck’s Orfea, both the Arsht and the Broward Center. Only in Miami, FGO will present Daniel Catán’s Florencia en el Amazonas, described as “an opera star goes down the Amazon on a magical quest,” a contemporary work inspired by the writings of Gabriel García Márquez. Palm Beach Opera will do Tosca, La Nozze de Figaro and Leonard Bernstein’s Candide. So, check out our calendar and clear yours. This entry was posted in News and tagged Actors Playhouse, An Inspector Calls, Area Stage Company, Arsht Center, Arts Garage, Billy and Me, Branden Jacobs-Jenkins, Broadway Across America, Broward Center, Building The Wall, City Theatre, Crest Theatre, Delray Beach Playhouse, Evita, Florida Children's Theatre, Florida Grand Opera. Palm Beach Opera, Fun Home, GableStage, Island City Stage, J’s Cultural Arts Theatre, Lake Worth Playhouse, M Ensemble, Mad Cat Theatre, Main Street Players, Maltz Jupiter Theatre, Miami New Drama, Million Dollar Quartet, MNM Productions, New City Players, On Your Feet!, outre theatre company, Palm Beach Dramaworks, Parker Playhouse, Pembroke Pines Theatre of the Performing Arts, Primal Forces, Robert Schenkkan, Slow Burn Theatre Company, Terry Teachout, The Humans, Theatre Lab, Thinking Cap Theatre, Wick Theatre, Zoetic Stage. Bookmark the permalink.